Maybe not since Florida Sen. Gary Siplin was photographed climbing a fence trying to avoid reporters has a media strategy failed quite so badly. 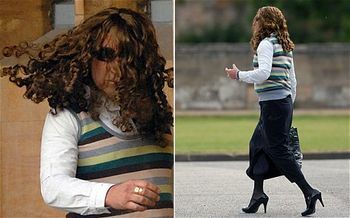 Whether he had difficulty walking in high heels or was given away by his obvious man hands and facial stubble is not clear, but according to the Daily Telegraph the "surprising disguise was noticed within seconds by the waiting photographers." Hopefully, Mr. Crute – who reportedly now has just £20 of disposable income per week after the fines that were imposed – didn't buy the outfit just for this purpose.